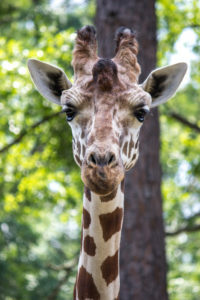 Unlike many hoofed animals, giraffes can see in color. They have very keen vision and hearing. They have 7 neck vertebrae, and oversized lungs compensate for the volume of dead air in the trachea. The giraffe heart is 2 feet long and thickly muscled. Blood pressure is 260/160, which is two or three times higher than a human’s. Their prehensile tongues are 18 to 22 inches long, and protruding hairy lips protect against thorns. Young giraffes are prey to lions, leopards, cheetahs, crocodiles, and hyenas. Lions will occasionally attack adults, and they are most vulnerable to attack when drinking because of the awkward stance they must use to lower theirs heads to the ground. However, a giraffe can kill a predator with a single blow from its hooves. Giraffes can run 30 to 35 miles per hour and can jump over obstacles five to nine feet high.